Today is the day Manu Samoa Sevens fans have all been waiting for. After weeks of preparations and intensive training, Sir Gordon Tietjen’s boys will open the Wellington Sevens against the home team this afternoon. 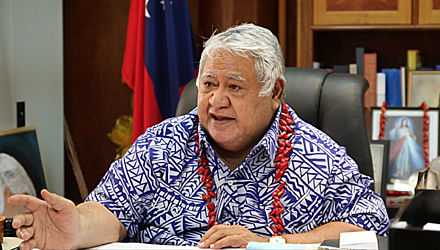 Yesterday, Prime Minister Tuilaepa Sa’ilele Malielegaoi who is also the Chairman of the Samoa Rugby Union, wished Tiejtens and the boys all the best. “We are hopeful that there will be changes with the performance of our Sevens team,” said Tuilaepa. “But we can only find out when we watch the games this weekend. Tuilaepa said the preparations have been extremely intense and he expects the players to be a lot fitter. “I’ve heard about some players who complained about how intensive the training have been; but that’s the way to victory,” he said. “We shouldn’t select players who are not willing to do everything to get the right results.